This sunflower wreath with a touch of wild leopard is one of my favorite. I am not sure if it is because yellow is my favorite color or if it is the leopard print bow, that adds a touch of wild, but here it is. This was a very quick and easy project to make. I started with a large oval grapevine form, which is half the beauty in itself. Next I simply added a group of sunflowers to the top bending them to look forward and to follow the shape of the form. I then added a group of yellow mums at the opposite corner. I found some wide ribbon that had leopard print on it, (leopard print another one of my favorites). My sister happened to stop in while I was making this and made the bow for me.- Thank you! There is no glue, everything is just stuck in the grapevine and the bow is ties on. You cannot get much easier that that! Do you have a Sunflower Wreath you would like to share in the Wreath Gallery? 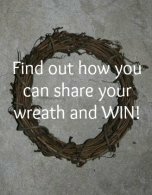 This is a good wreath for in between seasons or holidays. I made this as a fall wreath and it hung till Halloween. But it can also be a pre spring wreath for us here in Florida. The sunflower is so versatile it can be used spring, summer and fall. 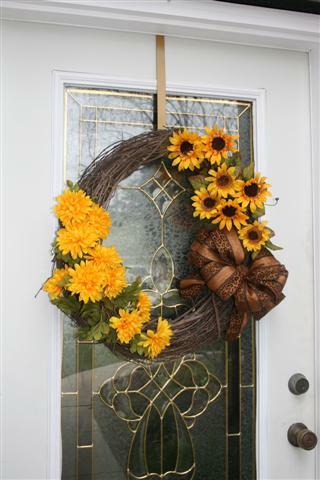 What season do you prefer to hang your sunflower wreath?